This theme could be anything. For example, a community could be based on a geographic location, historic event or a type of collection. One such community is Devon’s Heritage. Explore North Devon began in 2006 as an Archives 4 All project funded by the Heritage Lottery Fund with additional funding from Natural England through the North Devon Areas of Outstanding Natural Beauty. Originally the community published their object information to a bespoke website but chose to migrate to eHive in 2012. 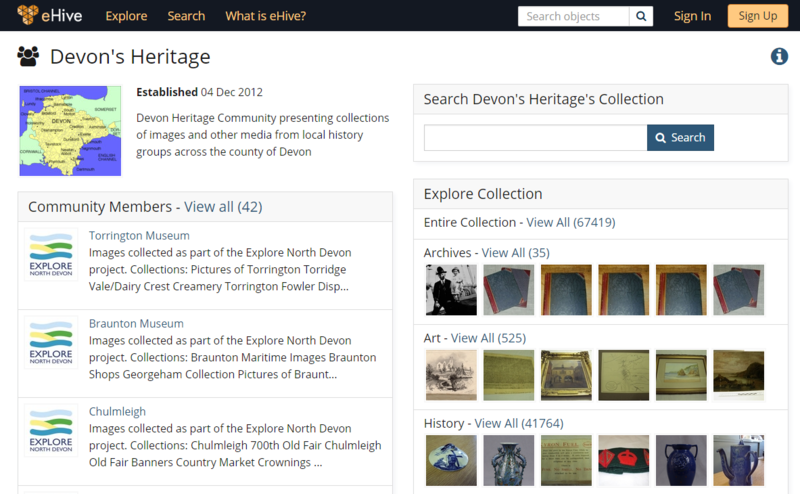 Today Devon’s Heritage Community consists of 42 collections, looking after 67,419 objects. Each community member manages their own archives. They have control over what information they catalogue and what information is shared publically. Any eHive account holder can create a Community and once it’s established other account holders can join and contribute their object records. Here are instructions to starting a community.